Refractory metals, characterized by their high melting point and resistance to oxidation, share many other attributes and applications; niobium and tantalum, in particular, are so similar to each other in properties and natural occurrence that the two were not definitely proven to be distinct elements until 1866. Niobium was the first of the two to be identified, in 1801 by British chemist and mineralogist Charles Hatchett. While employed at the British Museum, Hatchett became intrigued by a mineral sample displayed in the collection that had been sent decades earlier from the American colonies by Connecticut governor John Winthrop. His analysis of the sample yielded a substance he believed contained a heretofore undiscovered element that he named “columbium” for Columbia, the symbolic female embodiment of the United States, and the mineral itself came to be called columbite. Hatchett’s discovery was refuted shortly thereafter by British chemist William Hyde Wollaston, who claimed that columbium was in fact the same element discovered in a different mineral by Swedish chemist Anders Gustaf Ekeberg. Hyde argued that “tantalum” (Ekeberg’s name for the element, inspired by Greek mythological figure Tantalus) should subsume columbium as the sole official name for the substance. The debate was far from over. In 1845, German chemist Heinrich Rose analyzed the same mineral from Ekeberg’s experiment (which had subsequently been termed tantalite) and announced the sample contained two elements in addition to tantalum--which he fittingly named “pelopium” and “niobium” after Pelops and Niobe, the daughters of Tantalus. Though Rose was ultimately incorrect in classifying pelopium as the third element in the sample (rather than a mixture of the other two, as it turned out to be), the substance he called niobium was indeed a second, distinct element--the very same substance Hatchett had (correctly) identified as an element in 1801. The element itself was isolated in 1864 independently by both Christian Blomstrand and Jean Charles Galissard de Marignac, putting an end to the uncertainty about its identity, but not to the ambiguity surrounding its name; both niobium and columbium coexisted in common usage without any consensus. Despite the IUPAC’s 1950 decision in favor of niobium as its sole official name, it is still referred to as columbium in some circles. The difficulty in distinguishing between niobium and tantalum was due not only to their chemical similarity but also to the fact that the two never occur independently from each other in nature; besides columbite and tantalite, the two elements are found together in the minerals euxenite, manganocolumbite and manganotantalite, aeschynite, samarskite, simpsonite, tapiolite, and pyrochlore, the main commercial source of niobium when extracted as ferroniobium. It is also compercially prepared as a byproduct of tin extraction. de Marignac’s method of separating niobium from tantalum via fractional crystallization remained the primary method for many years, though other techniques such as liquid-liquid extraction were subsequently developed, all made possible by the differing densities of the two metals, niobium’s density being about half that of tantalum’s. A soft and shiny gray transition metal, niobium is ductile and malleable and can be cold worked over 90% before requiring annealing. Comparared to other refractory metals, niobium has the lowest density, melting point, modulus of elasticity, and thermal conductivity, and the highest thermal expansion. A thin film of niobium oxide ranging from yellow-green to blue in appearance provides surface passivation that makes the metal resistant to corrosion and attack by acids. Paired with its high strength and melting point, niobium’s resistance to oxidation make it an important component of alloys and superalloys such as Inconel 718, C103, and ferroniobium for high temperature, high stress applications like combustion equipment, jet engines, rocket assemblies, gas pipeline production, and air frame systems of spacecraft. It is also used in nuclear reactors due to its low neutron absorption cross section. Adding niobium to carbon and alloy steels increase their strength, toughness, and machinability. Niobium alloys are often used for arc welding rods for stabilized grades of stainless steel and in the arc-tube seals of high pressure sodium vapor lamps; one of the first commercial uses for the metal was in incandescent lamp filaments before being supplanted by tungsten. Niobium is non-toxic and does not react with human tissue, and as such is commonly used in surgical implants and medical devices; it can be colored by anodization, and is used in some jewelry. Niobium has the largest magnetic penetration depth of any element and, along with vanadium and technetium, is one of the three elemental type-II superconductors--materials that exhibit superconductivity in both strong electric currents and magnetic fields. Niobium-tin alloy (Nb3Sn) was the first such material to be discovered in 1961 at Bell Labs. Niobium-tin wires, niobium-zirconium wires, and niobium-titanium wires are used in the high power superconducting magnets in MRI scanners, nuclear magnetic resonance instruments, and CERN. Niobium oxide has been used in metallic glass and smart windows, and is increasingly used in electronics and optics due to its high dielectric constant; lithium niobium oxide (lithium niobate, or LiNBO) is a common non-linear optical crystal. Due to its similar properties and wider availability, niobium is a potential lower-cost subsitite for tantalum used in capacitors and transistors in microelectronics. Niobium's main use is in alloys where it is used to produce arc-welding rods and corrosion-resistant steel. Other applications include its use in superconducting materials, electronics, optics, numismatics and jewelry. Niobium is the basis for various barium titanate compositions used as dielectric coatings in telecommunications and small advanced electronics, such as cell phones, pagers and laptop computers. Niobium has medical research applications as well. Niobium is available as metal and compounds with purities from 99% to 99.999% (ACS grade to ultra-high purity). Elemental or metallic forms include pellets, rod, wire and granules for evaporation source material purposes. Niobium nanoparticles and nanopowders are also available. Niobium oxides are available in powder and dense pellet form for such uses as optical coating and thin film applications. Oxides tend to be insoluble. Niobium fluorides are another insoluble form for uses in which oxygen is undesirable such as metallurgy, chemical and physical vapor deposition and in some optical coatings. Niobium is also available in soluble forms including chlorides, nitrates and acetates. These compounds can be manufactured as solutions at specified stoichiometries. Niobium is a Block D, Group 5, Period 5 element. 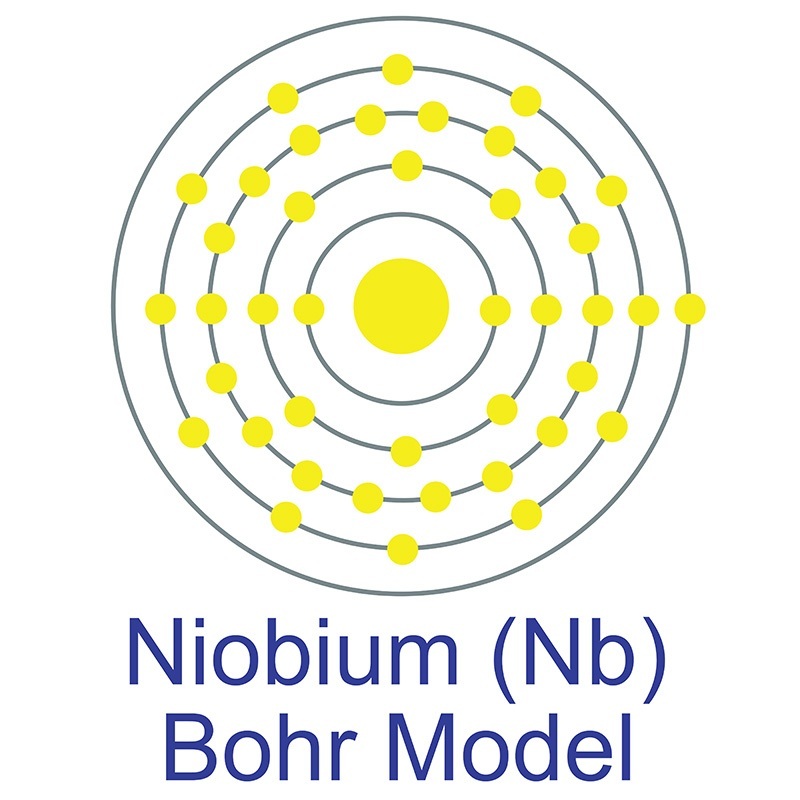 The number of electrons in each of niobium's shells is 2, 8, 18, 12, 1 and its electronic configuration is [Kr] 4d4 5s1.The niobium atom has a radius of 142.9.pm and its Van der Waals radius is 200.pm. In its elemental form, CAS 7440-03-1, niobium has a gray metallic appearance. Niobium has the largest magnetic penetration depth of any element and it's one of three elemental type II superconductors (along with vanadium and technetium). Niobium is found in the minerals pyrochlore, its main commercial source, and columbite. It is not found in nature as a free element. Niobium was first discovered by Charles Hatchett in 1801. The word Niobium originates from Niobe, daughter of mythical Greek king Tantalus. Some niobium compounds are considered toxic. Safety data for Niobium and its compounds can vary widely depending on the form. For potential hazard information, toxicity, and road, sea and air transportation limitations, such as DOT Hazard Class, DOT Number, EU Number, NFPA Health rating and RTECS Class, please see the specific material or compound referenced in the Products tab. The below information applies to elemental (metallic) Niobium. environment without proper governmental permits.